In 2017, RBSC received thirty poster-sized prints (53 x 77 cm) from Grailville, a non-profit Catholic organization in Loveland, Ohio. 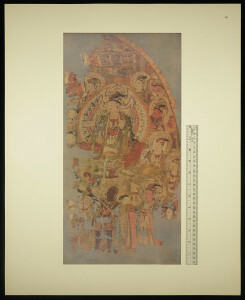 Little was known about the prints. They were not dated. 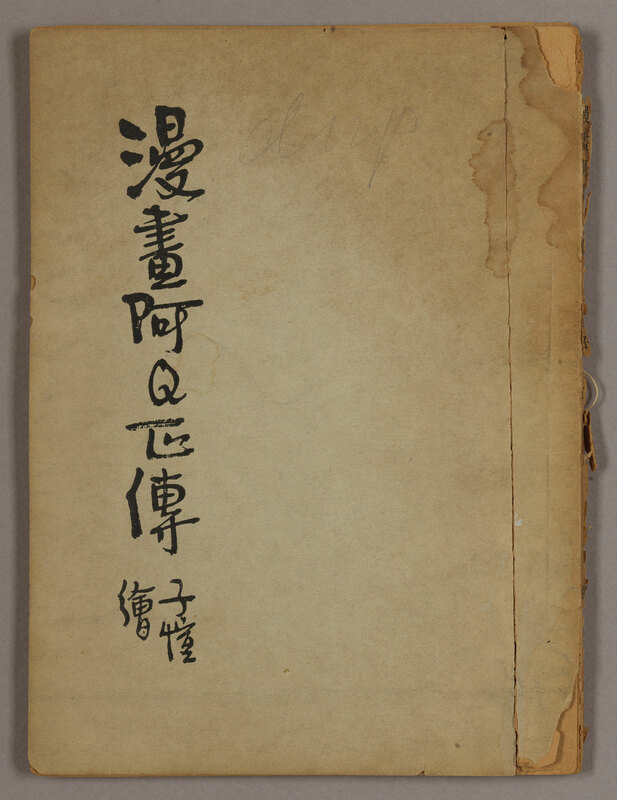 They contained a copyright statement by the Catholic University of Peking (1925-1952). 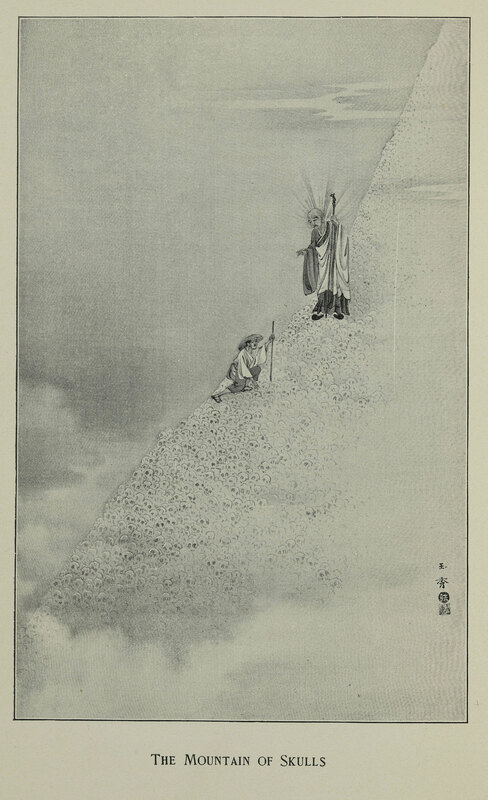 They were apparently reproductions of Chinese-style paintings and calligraphic messages that illustrated the Bible. They appeared to have been intended for the Chinese audience. Based on the following two sources, we now assume that these prints are copies of paintings done in Xinxiang, Henan in 1939 by Wang Suda. 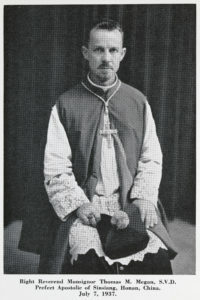 Frontispiece portrait of the Right Reverend Monsignor Thomas M. Megan, S.V.D. from Atomic Apostle. The Xinxiang series at RBSC, though fewer and smaller in size, are possibly a reprint of the above-mentioned series. 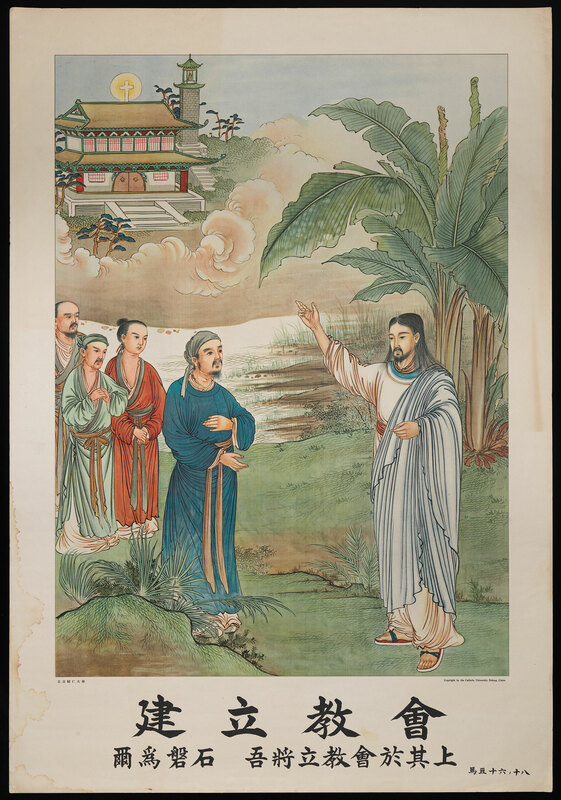 The Xinxiang series is distinctive, and perhaps unique, in comparison to other paintings by Wang, and to paintings by his contemporary Chinese Christian artists. 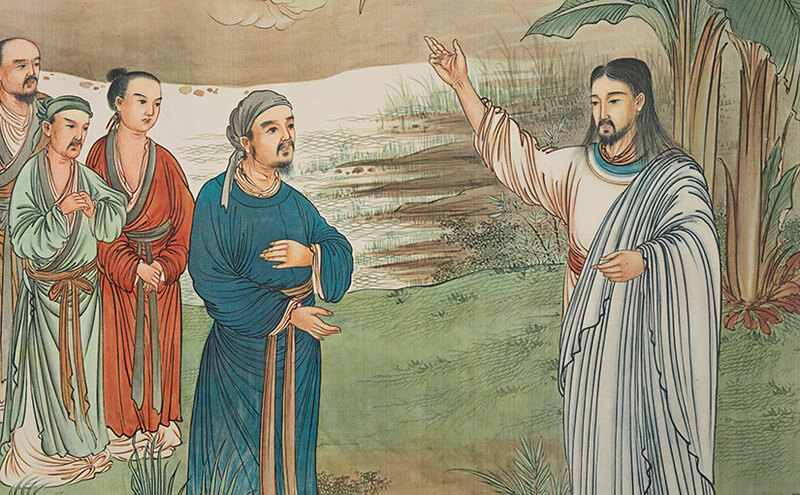 In one painting, Jesus points at Peter and says, “You are the rock, Peter on which I will build my Church.” Peter, like the Bishop Megan, has a goatee and wears a “simple blue Chinese gown.” The church in the background resembles the “Chinese-style” church that the Bishop had built. Currently there are no events scheduled to be hosted this summer in Rare Books and Special Collections. The exhibit In a Civilized Nation: Newspapers, Magazines and the Print Revolution in Nineteenth-Century Peru will run through the summer and close on August 10, 2018. 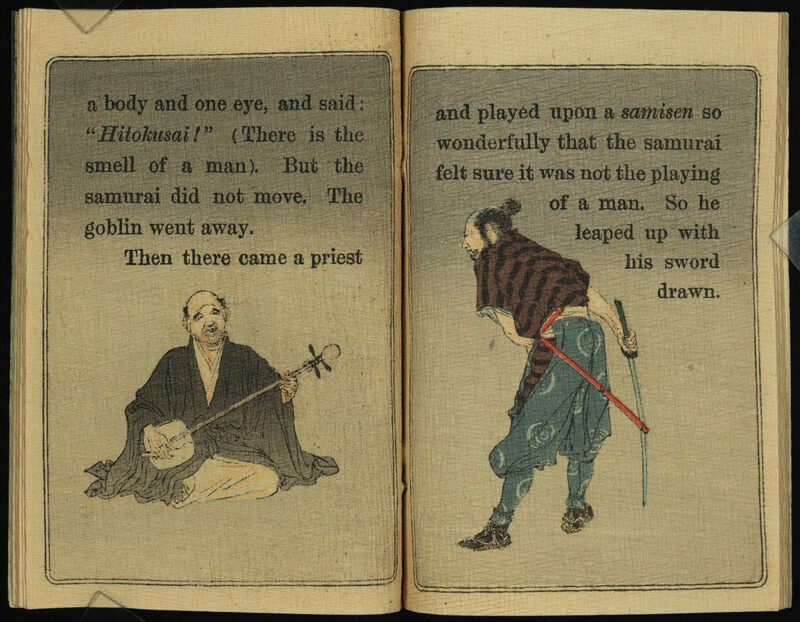 The current spotlight exhibits are Chaste, Choice and Chatty: Irish‑American Periodicals of the Nineteenth Century (April – August 2018) and Jesuit Science in 17th and 18th Century China (May 2018). RBSC will be closed Monday, May 28th, for Memorial Day and Wednesday, July 4th, for Independence Day. 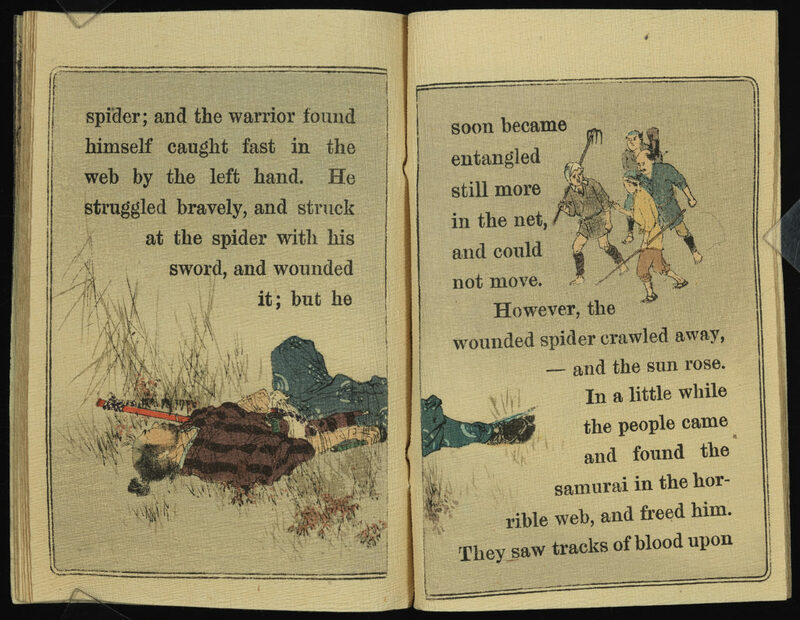 Ancient Japan, samurai warriors, and your casual spider—casual, that is, until nightfall. 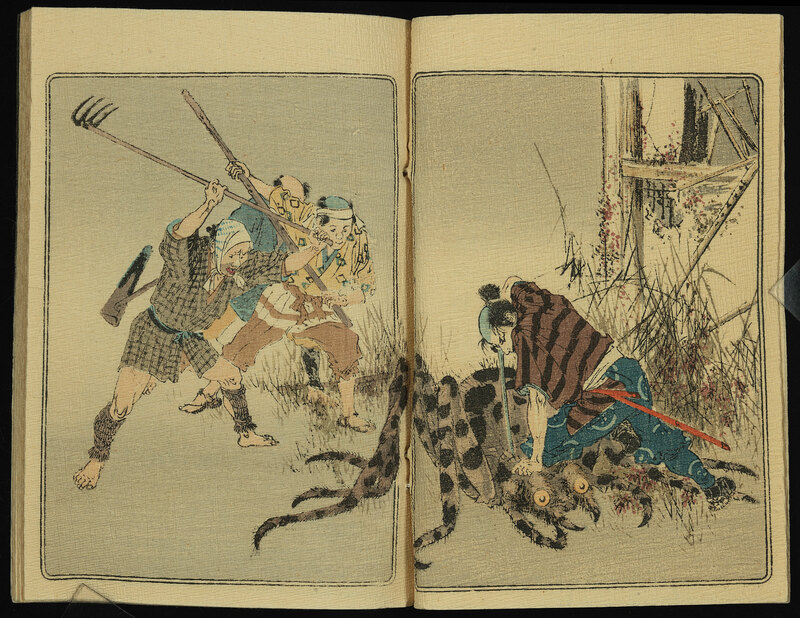 According to ancient Japanese legend, these ordinary spiders would morph as dark night enveloped the landscape. 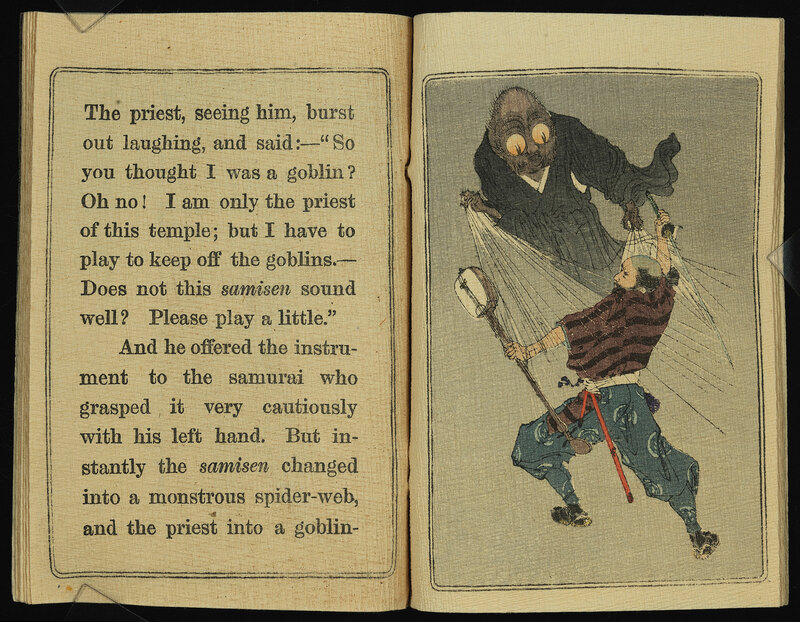 Menacing pincers, bulging eyes, and even taking on human form to deceive unsuspecting victims—like the samurai in the tale below—these goblin spiders wreaked terror. 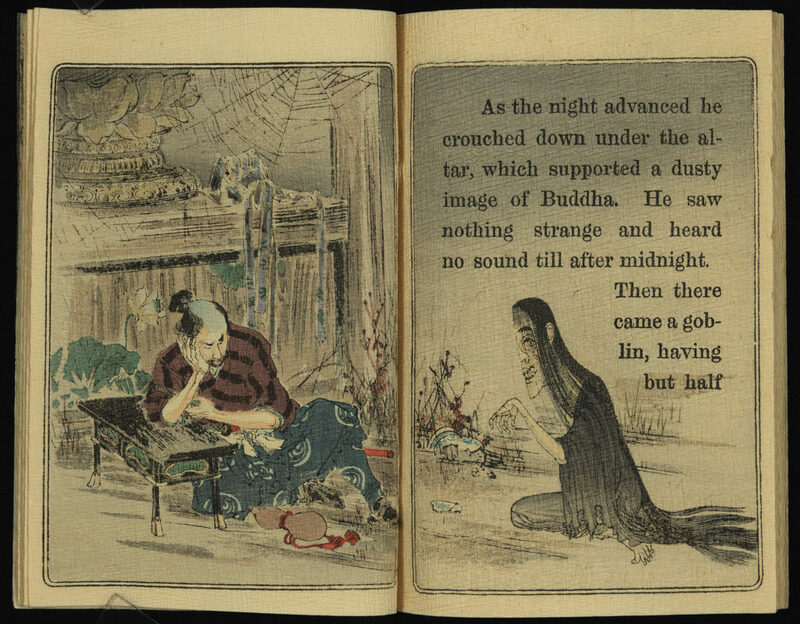 Lafcadio Hearn brings this ancient tale, one of many in the Japanese tradition of ghost stories known as kaidan, to English readers. 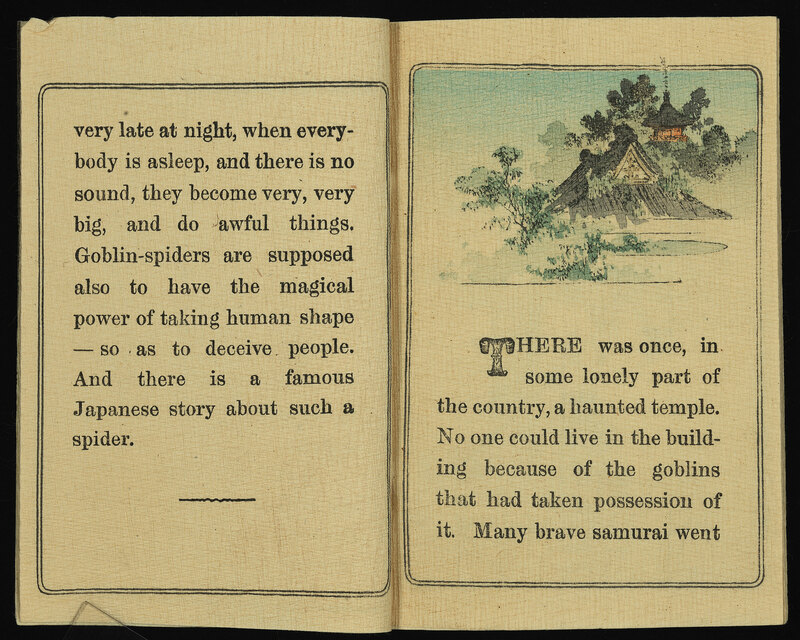 The Goblin Spider is lavishly illustrated in Takejiro Hasegawa’s five-volume set of crepe-paper books. These brightly colored illustrations are hand-printed using wood blocks on textured pages. Hearn, Lafcadio. The Goblin Spider. 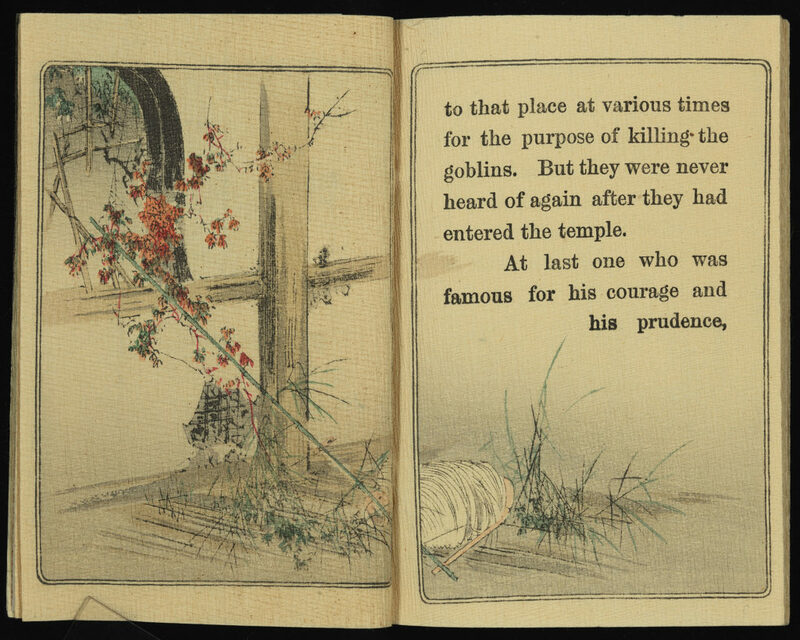 Kobunsha’s Japanese Fairy Tale Series. Second series. No. 1. 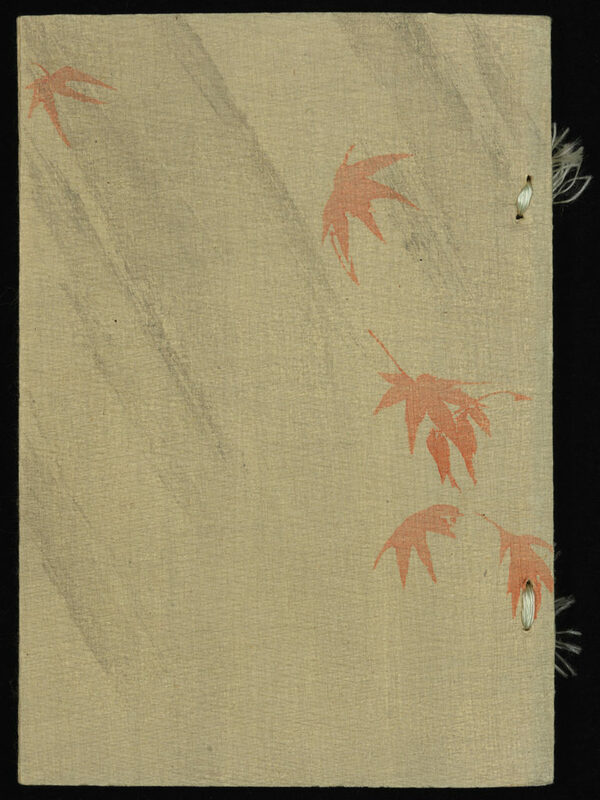 Tokyo: T. Hasegawa, 1899. 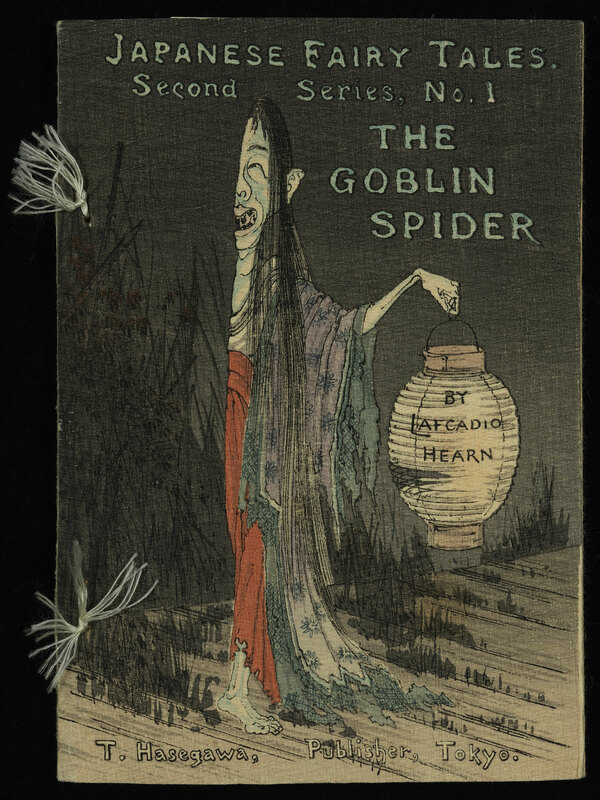 Happy Halloween to you and yours from all of us in Notre Dame’s Special Collections! 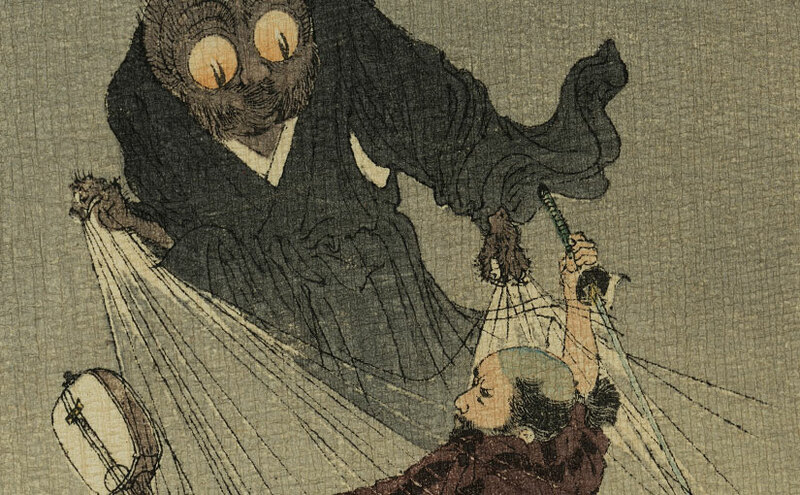 This image and warning drawn from mythical Japan resonated all too well with the author, who himself had lived many lives. 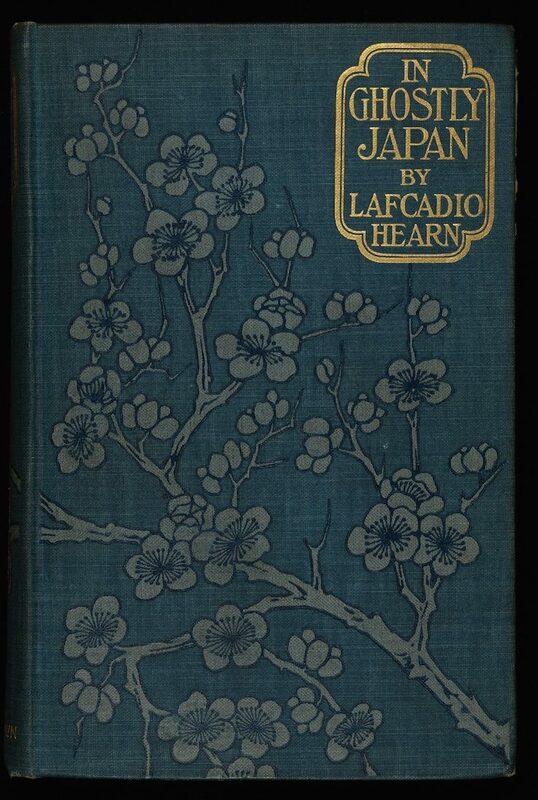 Lafcadio Hearn (1850-1904), born in western Greece on the island of Lefkada, was the son of an Irish military surgeon and a mother native to the Greek island of Kythira. Raised and educated in Ireland, Britain, and France, Hearn emigrated to the United States when he was nineteen, where he held menial jobs before becoming a translator and journalist. 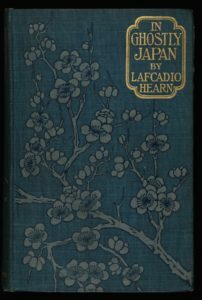 In 1890, Harper’s offered Hearn the opportunity to go to Japan to write about the country’s efforts to modernize. 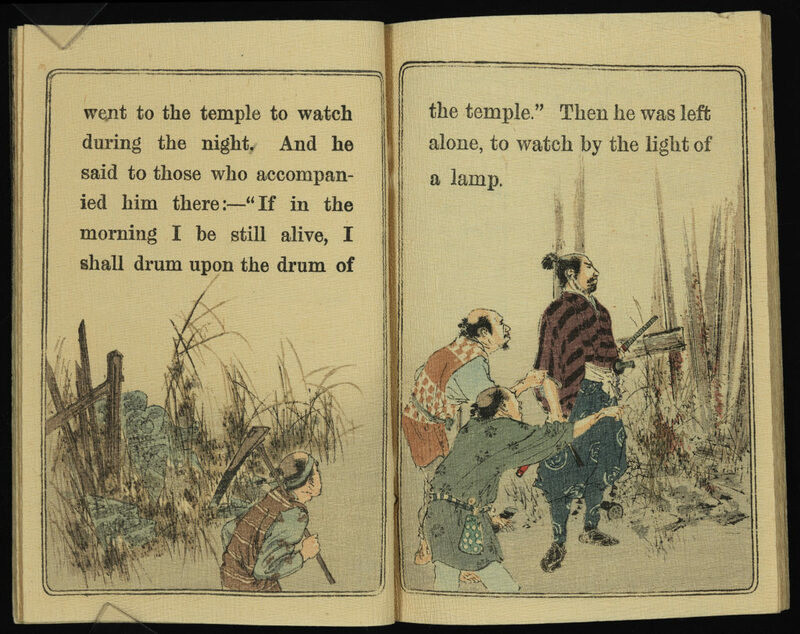 Shortly after arriving, Hearn became enthralled with Japan—the atmosphere, the cities and towns, the magical-looking trees, the temples, the people. He recorded his first impressions in series of essays and, after marrying the daughter of a samurai family, Hearn took the Japanese name, Koizumi Yakumo, and immersed himself in the culture of old Japan, looking for the “roots” of his beloved new home. A newspaper reporter suddenly made professor, Hearn was appointed in 1895 as Chair of English literature at the Imperial University of Tokyo. 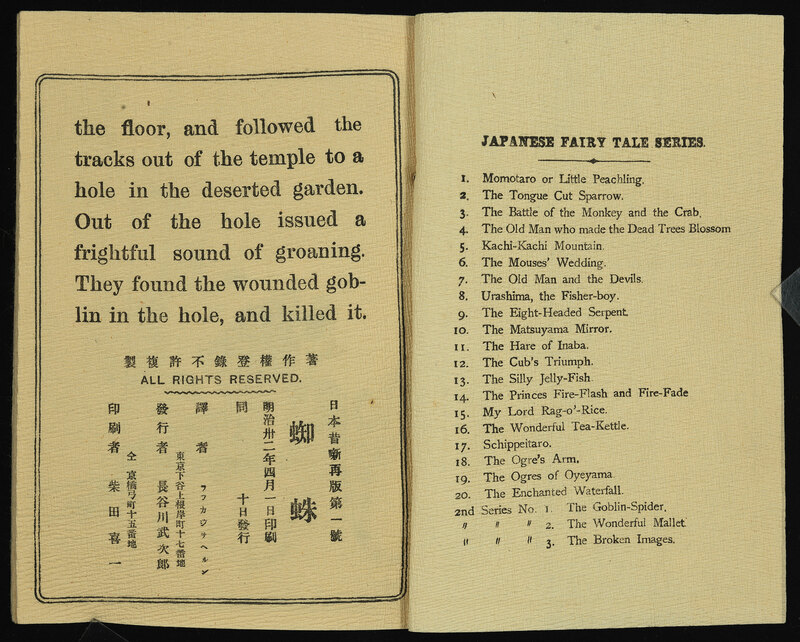 During the next eight years, Hearn authored four works that reveal his deep understanding of and immersion in Japanese culture, religion, and literature. These works included Exotics and Retrospectives (1898), Shadowings (1900), A Japanese Miscellany (1901), and the book featured here, In Ghostly Japan (1899). 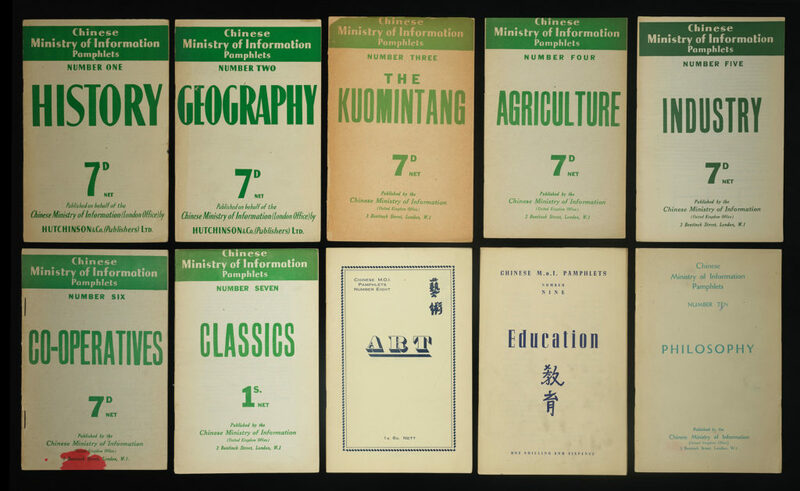 Published in succession from 1944 to 1946, this collection of 10 pamphlets was produced by the Republic of China’s Ministry of Information’s United Kingdom Office. Together they offer an interesting perspective on the Chinese Nationalist (Guomindang) government’s information campaign outside of China during the 1940s. 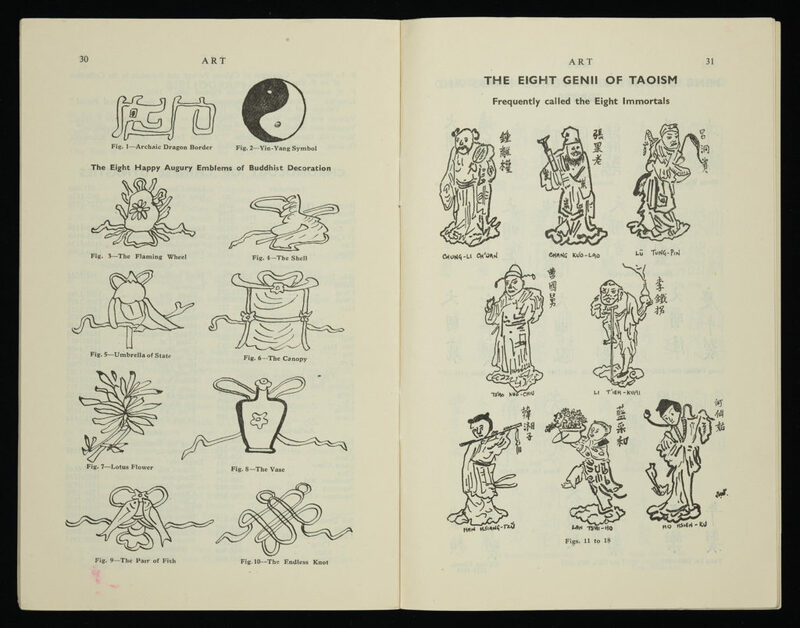 The pamphlets cover a wide range of topics on China and are intended for different audiences. The first, seventh, eighth, ninth and tenth works in the collection discuss history, classics, art, education and philosophy and were designed for the general public. 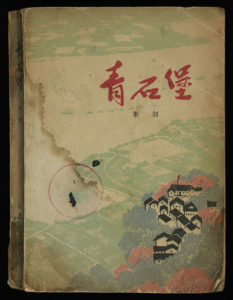 The second pamphlet, produced for British military and diplomatic personnel during World War II, gave them a general overview of the geography of China. 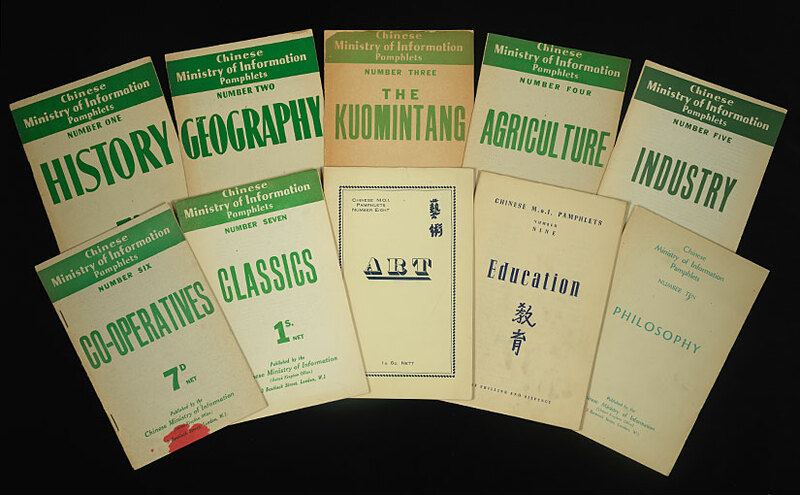 Remaining pamphlets introduce readers to the situation of China immediately following World War II. 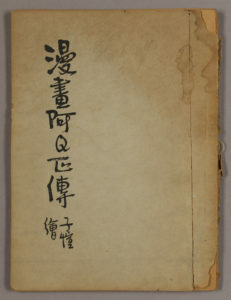 The third pamphlet, on the Guomindang, gives a general discussion of the history of China’s governing party at the time. It describes the party’s ideology, political agendas and brought readers up to date on the Guomindang’s conflicts with the Chinese Communist Party, which had led to civil war during the 1940s. 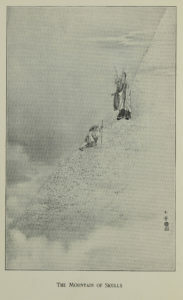 Pamphlet four, discussing agriculture in China, assesses the reason behind the country’s poverty. It argues that China’s rural masses can only be uplifted from poverty through gradual measures such as tax reform, improved agricultural methods and industrialization. The sixth pamphlet gives an overview of Chinese Industrial Cooperatives, a program that encouraged and provided assistance to small scale rural industrial enterprises in the country. 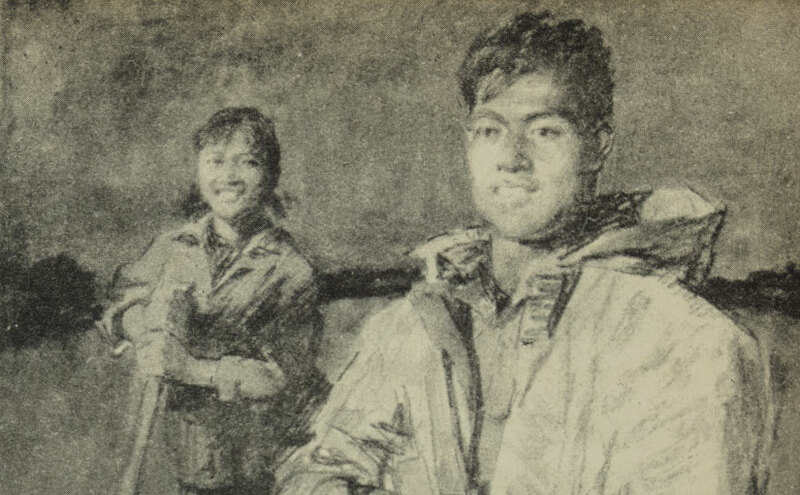 Started by a group of Chinese and foreign benefactors in World War II, the program was supported by the Guomindang and was seen as a way to both economically sustain the country during wartime and offer employment for idle rural inhabitants and refugees. 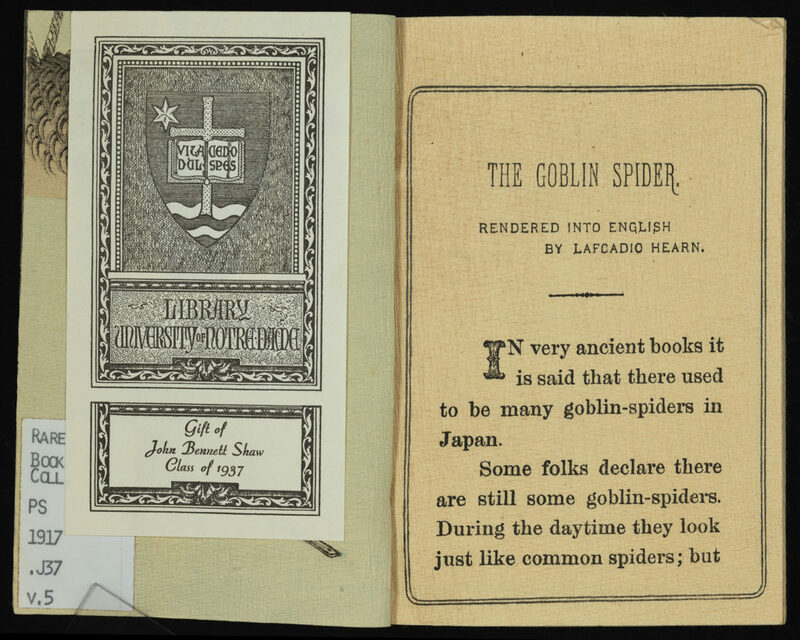 The pamphlets in general were created for an educated audience, with good knowledge of western high culture, geography and economic issues. Due to this they were written with remarkable sophistication. The works were authored by a variety of experts on China, both within and outside of the country, including Neville Whymant, a well-known British oriental scholar at the time, Lu Guangmian (卢广绵), a founder of Chinese Industrial Cooperatives and Wu Yuanli (吴元黎), a respected Chinese economist. Works on Chinese history and philosophy, though brief, attempt to stimulate intellectual curiosity towards China. They introduce readers to sources on classical China and draw their conclusions on Chinese civilization from a variety of scholarly resources. 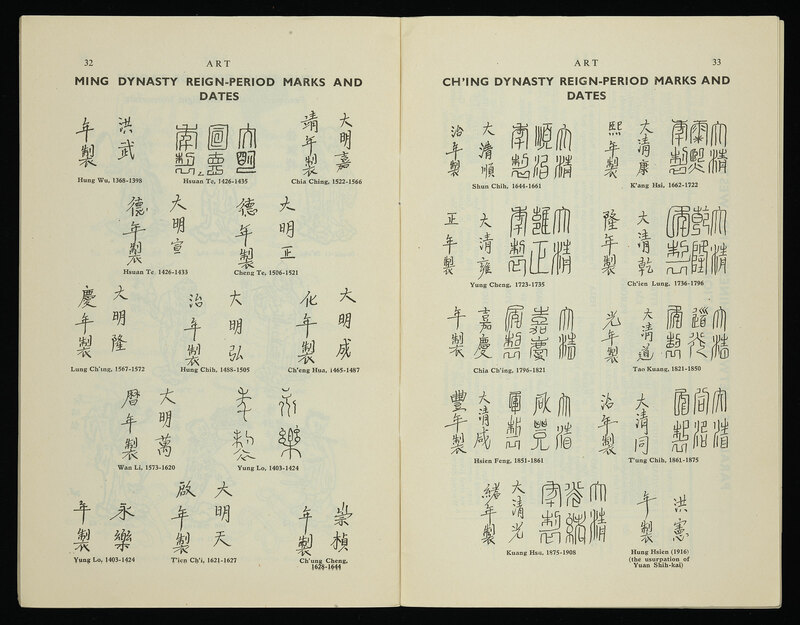 Such works also contain useful guides for understanding China, such as charts on Chinese dynasties, reign dates of Chinese emperors since 1368 and diagrams of Buddhist and Daoist symbols (See photos). 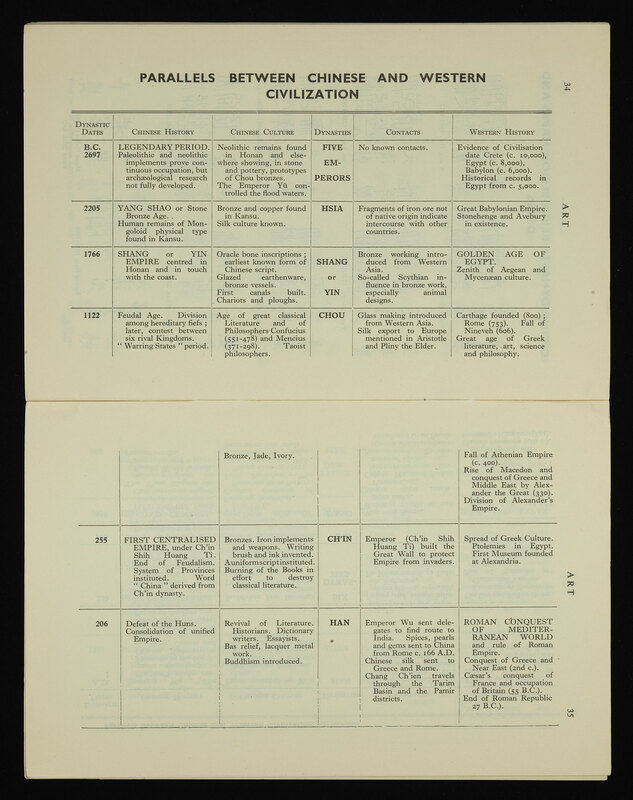 Pamphlets also compare important events in Chinese history with developments in the West and differences and similarities between classical Chinese and Greek philosophy. 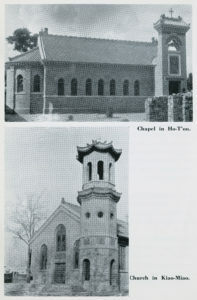 Pamphlets on contemporary China were produced with propaganda purposes in mind. They promoted the Guomindang’s view that China’s problems must be resolved by gradual reforms as opposed to the Communist agenda of radically changing the country through class revolution and redistribution of property and encouraged foreign assistance with Guomindang programs. However, to appeal to their specific audience the pamphlets took an approach of explaining issues through selected facts rather than slogans and moral exhortation. They discuss matters such as poverty and industrial development in China to great length, often citing statistics and other information from independent studies. Information campaigns between the Guomindang and Chinese Communists towards foreigners during the 1940s are an important part of the history Sino-western relations. To some degree the Chinese Communists successfully swayed foreign opinion to their side in 1949, and their seizure of the country that year led to many discussions among foreigners on whether they were deceived or “lost” China due to their poor knowledge of the situation of the country. 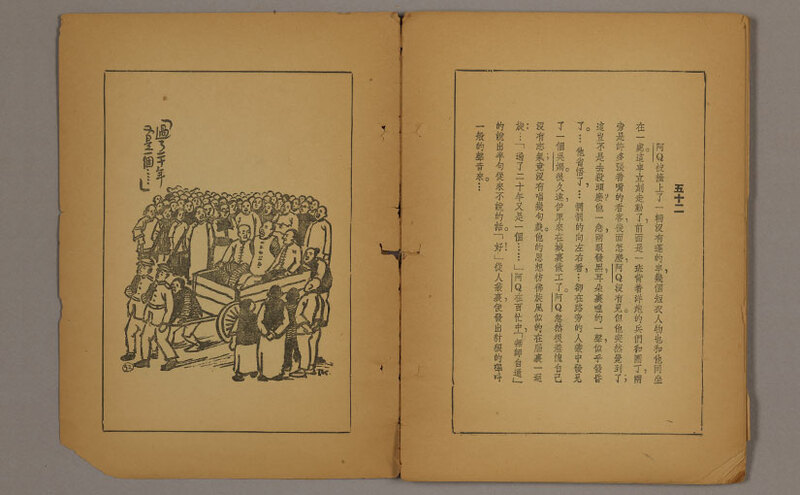 Pamphlets in the collection are a small piece of the Guomindang’s foreign outreach, and they offer insights on the party’s approach towards foreigners during the period. 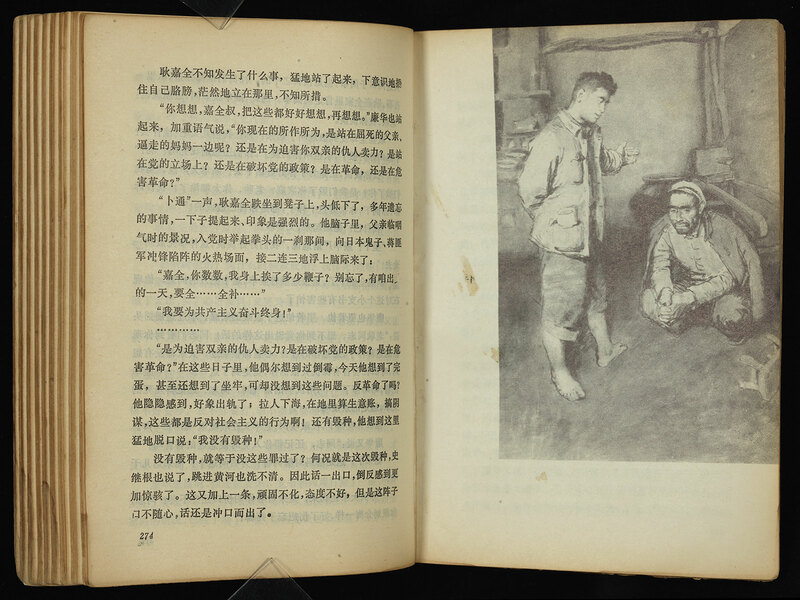 Included in the recent gift from the University of Chicago is Lu Xun’s famous The True Story of Ah-Q published by Kaiming Book Company during the Sino-Japanese War (1939-1945), with illustrations by Feng Zikai. According to Feng’s preface, the set of illustrations in this edition was done for the third time after his first two sets were lost in the chaos of the war. The Libraries’ copy is the ninth reprint of the 1939 (Minguo 28) publication. 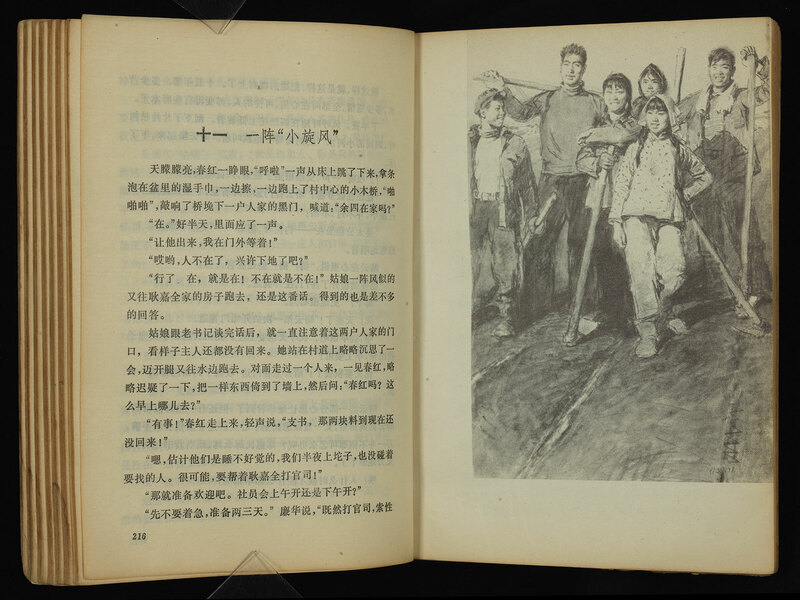 Zhu Jian’s Qing shi bao, a Cultural Revolution novel published in 1976, includes illustrations by Chen Danqing that are examples of Cultural Revolution art, and also of the artist’s works in that time period as an “educated youth” in rural areas. Approximately one year later, Chen completed his famous painting “Writing a Letter to Chairman Mao,” and traveled to Tibet where he got inspired for his Tibet series. This Tokyo reprint (1978) was praised by Dr. W. Pachow, a Chinese Buddhist scholar, as a “extraordinary” and “very valuable.” His review that appeared on The Journal of the International Association of Buddhist Studies in 1981 is a worthy introduction to the resource that includes a detailed description of the size and composition of the folio and its contents. Also important to note is Dr. Pachow’s point about a few unintended misinterpretations by Sir Aurel Stein who did not understand Chinese. Die buddhistische Spätantike in Mittelasien: Ergebnisse der Kgl. 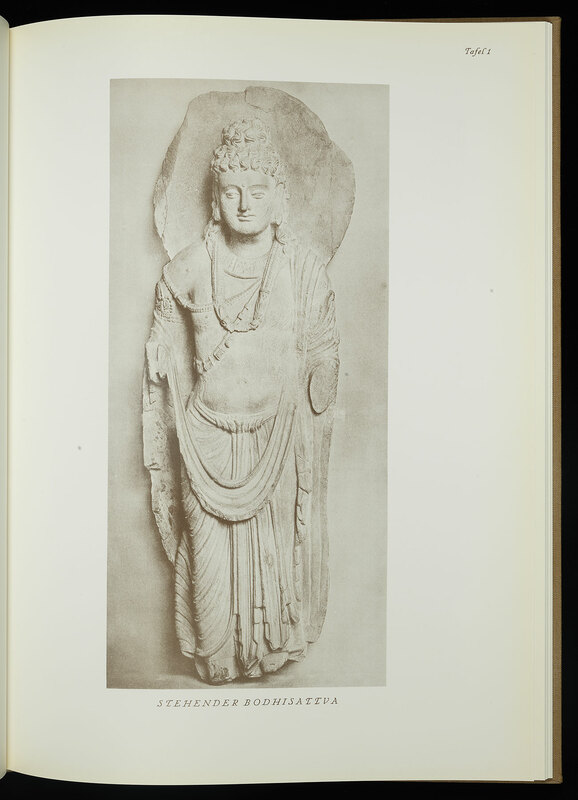 preussischen Turfan-Expeditionen (Postancient Buddhist Culture in Central Asia: Results of the Royal Prussian Turfan-Expedition). Records of items recovered and described by Albert von Le Coq. This 1973-1975 print of the original Berlin edition (1922-1933) consists of seven volumes. Detailed descriptions about the first five volumes are available online. 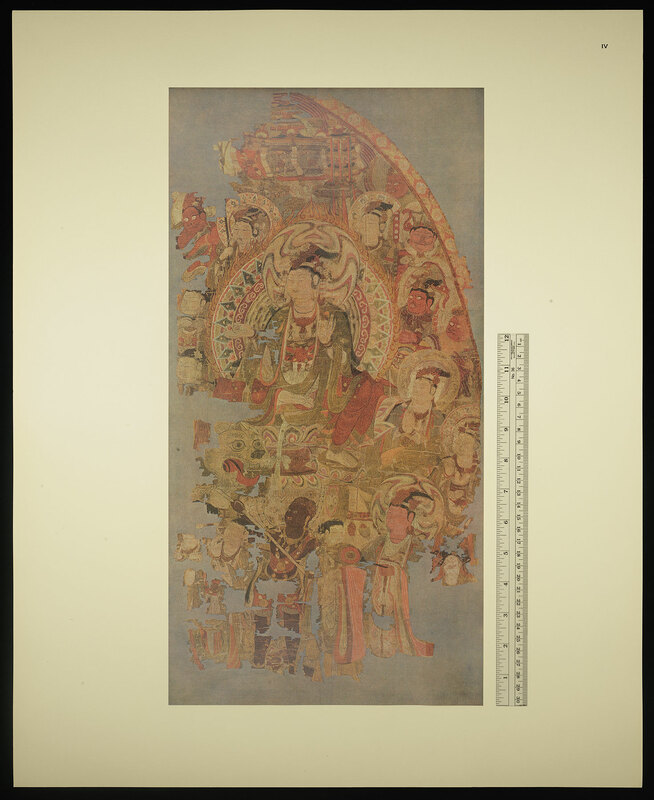 The publications symbolically represent the early 20th century history of the Silk Road where long-lost cultural relics were discovered and then disappeared again, some of them permanently. 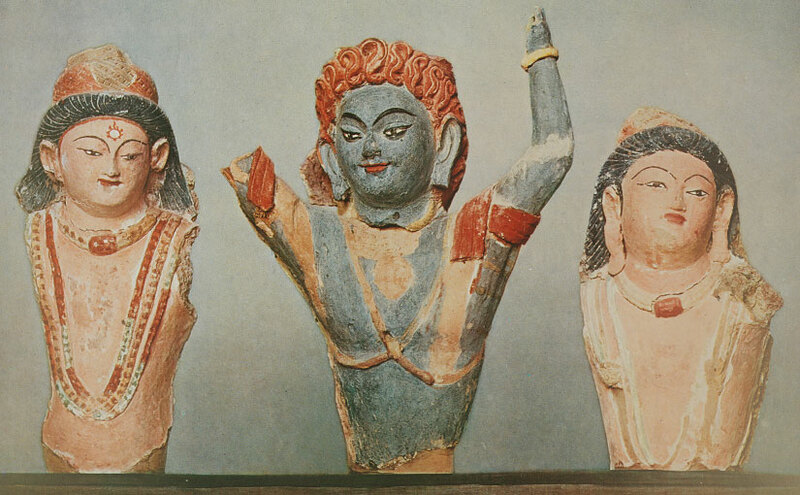 Peter Hopkirk’s Foreign Devils on the Silk Road: The Search for the Lost Cities and Treasures of Chinese Central Asia is a classic that tells of of the brave expeditions the above authors are credited with (or the blatant exploitation that they are accused of).